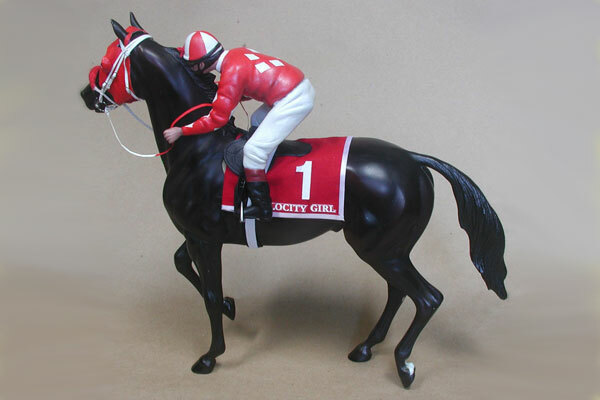 I completed this traditional scale jockey in 2009 and hand cast him in a 1st edition. 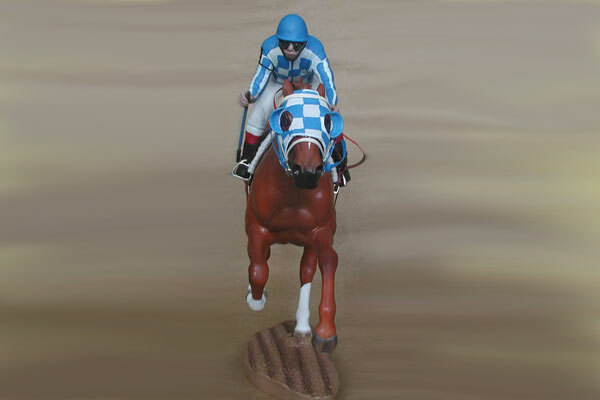 (1st edition is sold out) He is designed to ride all 3 running Breyer race horse molds, with tack on. 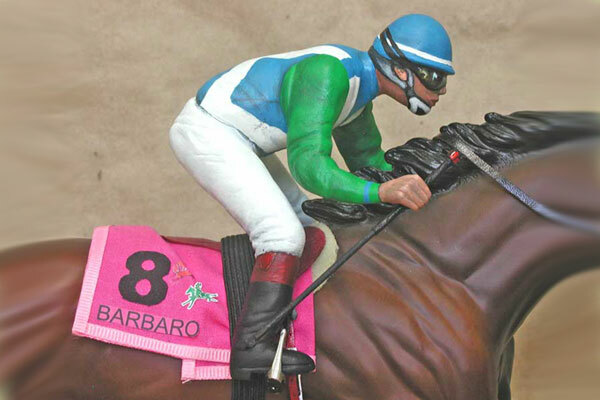 (Ruffian, Smarty Jones, and Cigar molds) You can purchase customized race tack from the tack section of this website! He should be great for performance live showing! 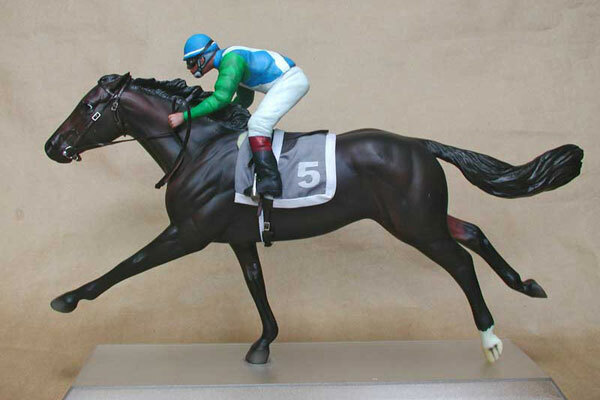 In 2012, I made a few improvements and had him professionaly cast in resin for a 2nd Edition. Still available for a limited time. Get one before they are all gone! 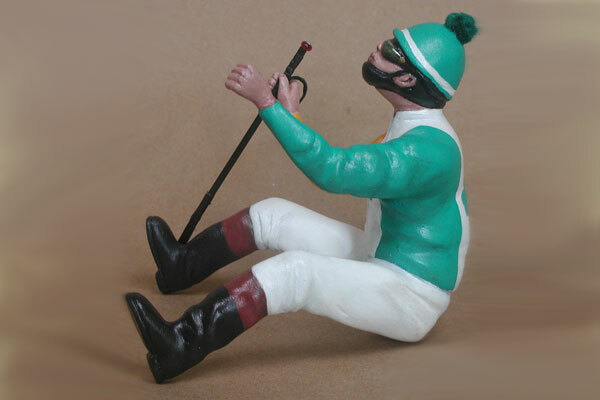 He is depicted in full professional racing attire! 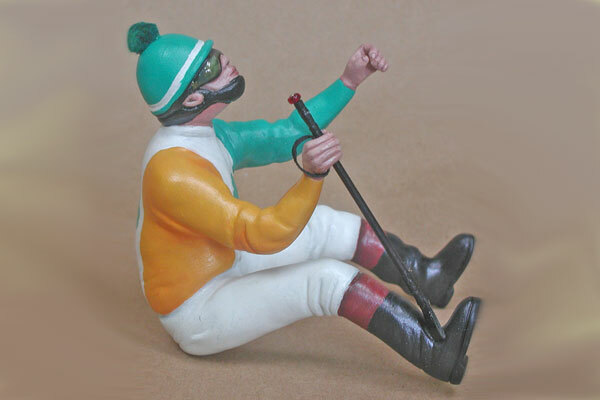 He's wearing a few layers of goggles, a regulation helmet, his stable's racing silks, breeches and boots. 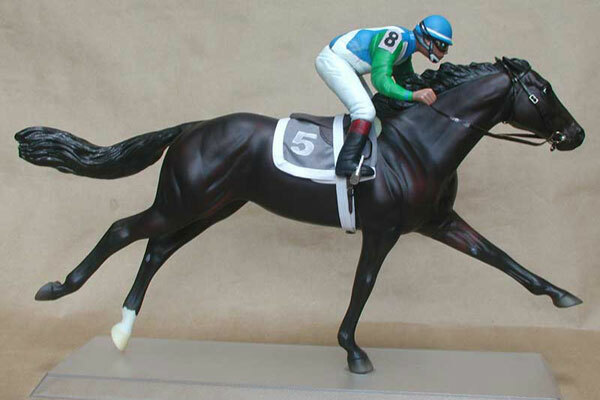 2nd Edition is being professionally cast by "Resins by Randy" in resin with no wires. 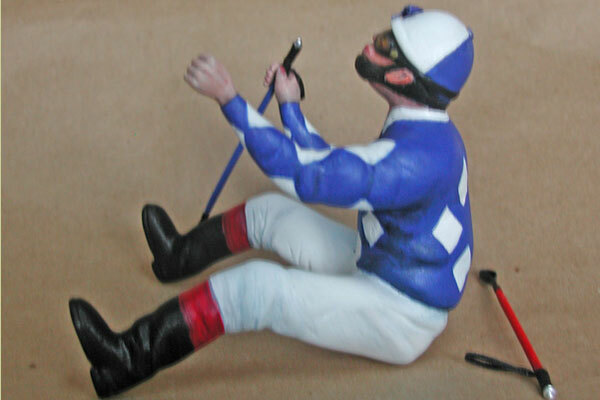 This means that his legs and arms can be slightly bent using heat to make him fit a greater variety of models. 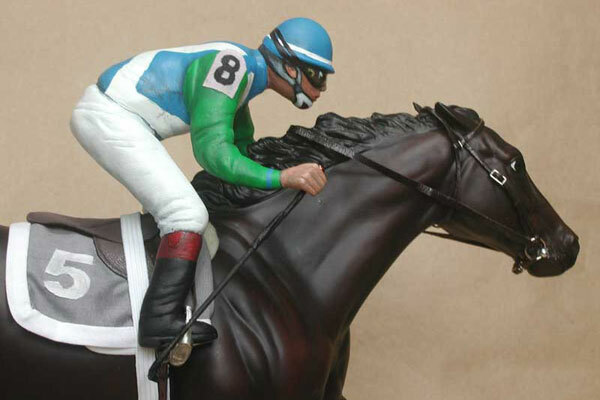 Free 1st class shipping to US destinations andInternational destinations. Priority mail shipping is available at discounted cost. Contact me for an expedited shipping quote. 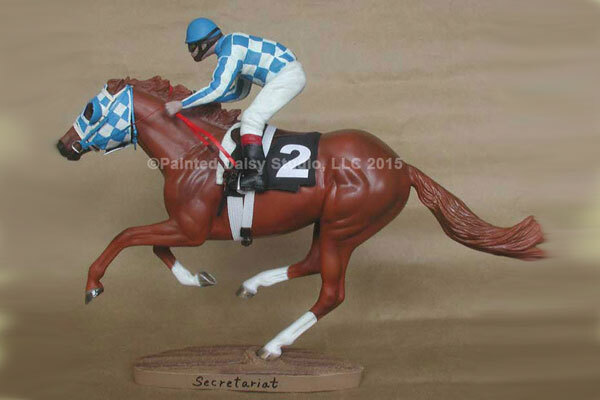 You can either order one unpainted for $75.00 (has had minimal prep done and will require more preparation; sanding, and primer coating prior to painting.) 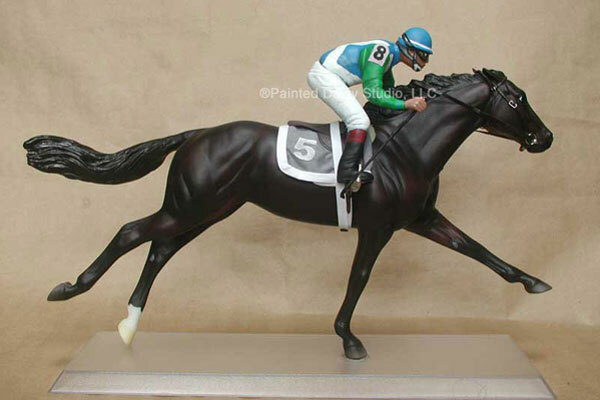 Or you can have me prep and paint him for $115.00, in your customized race colors, to suit your own set up! 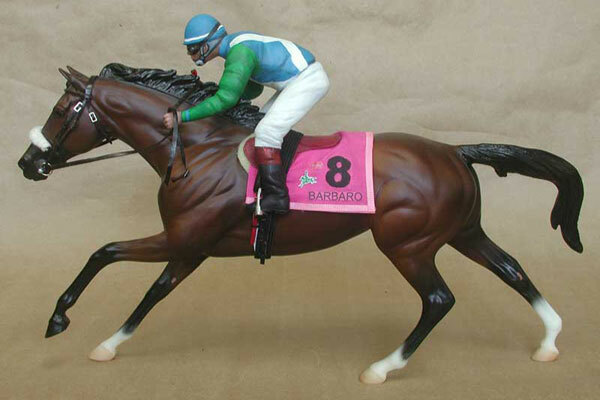 You can order him to be painted to resemble real-life Jockeys in the barn colors of the famous race horse of your choice; Such as Edgar Prado on Barbaro winning the Kentucky Derby! 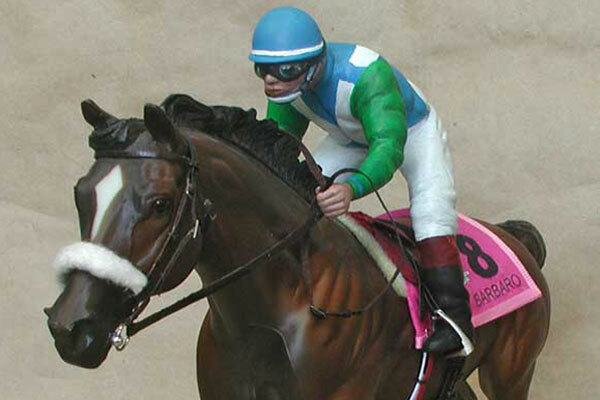 You can also order matching race tack with the correct color number saddle cloth for that particular race! You can even add a tiny pom pom or bow to his helmet. 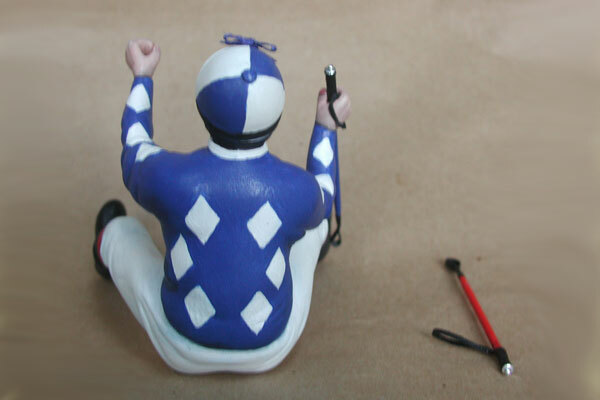 If you want to show with a realistic set up, please read about what is allowed by the Jockey Club in the links below. Please e-mail me with any questions! I'm happy to discuss your ideas! 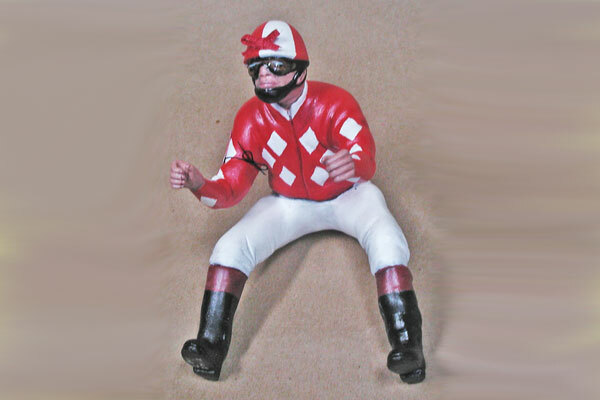 If ordering a painted Jockey, please read and submit the form below with your design. 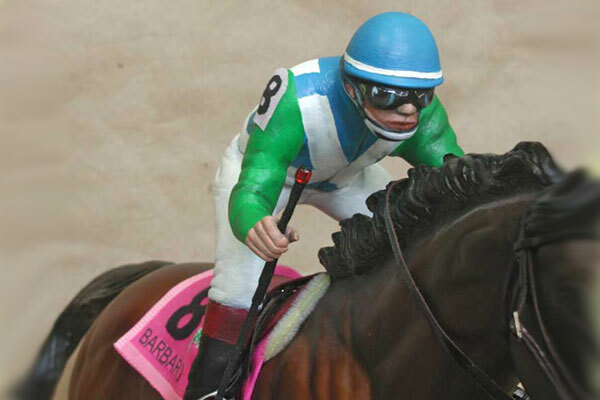 If you don't know what the design is supposed to be for a particular jockey/race/stable etc., you can e-mail me and I will look it up for you. 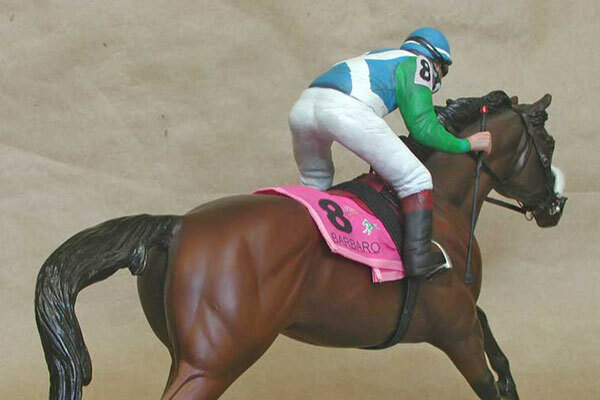 **See special instructions below for choosing a color scheme for your jockey below, based on actual rules governed by the United States Jockey Club. 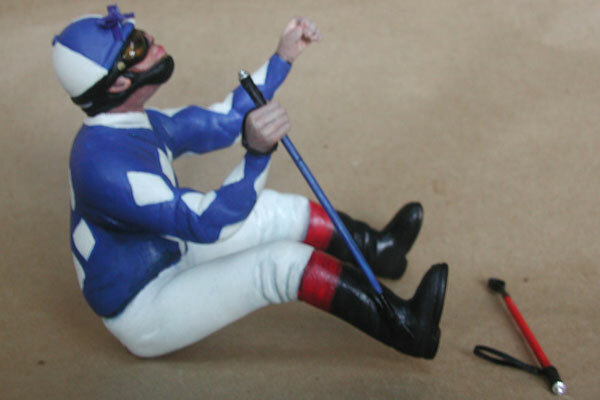 Click Here to see the standardized colors for 21 post positions. 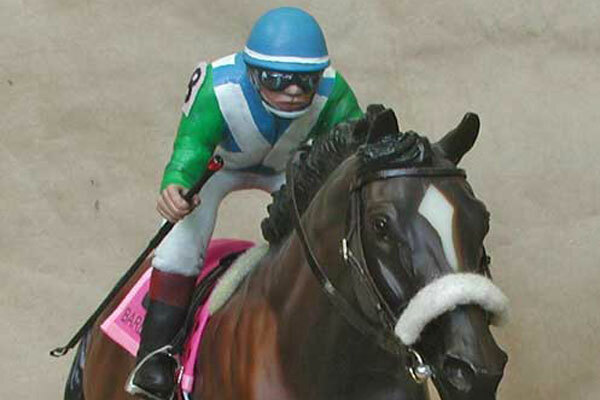 The Jockey Club of the United States has specific instructions on what is allowed in the design and colors of a Jockey's silks, which represents the owners of the horse. 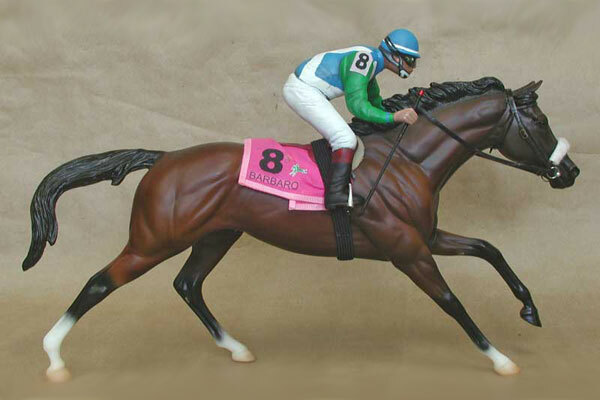 Each design and color scheme must be registered with the Jockey Club in order to be allowed to race on a track in the United States. 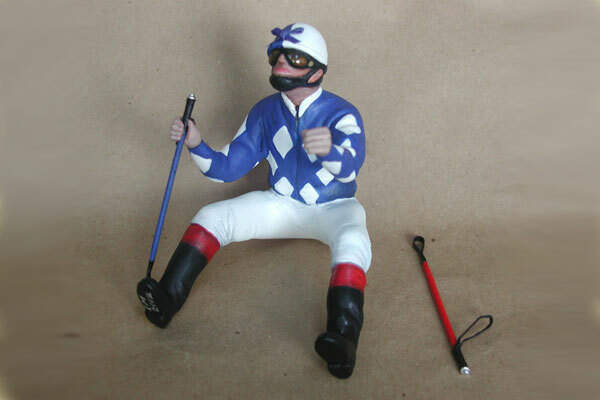 I have duplicated their registration form and included it's instructions so that you may design a reaslistic scheme for your resin jockey. 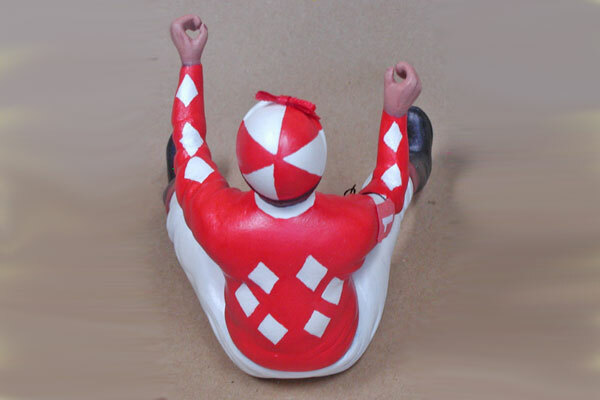 Please fill out this order form, (click here) and submit it to me with your order for a painted resin jockey. 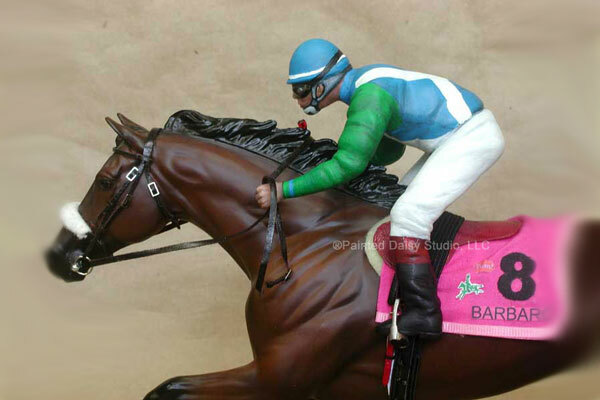 Please note: The numbered saddle cloth is NOT supposed to match the jockey silks colors! 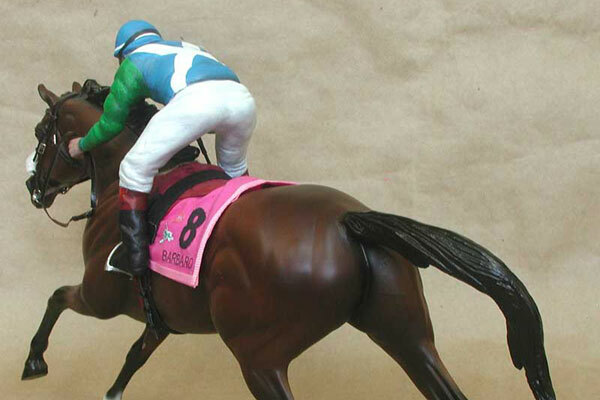 The color and number of the saddle cloth is determined by the post position drawn for each horse for each race. 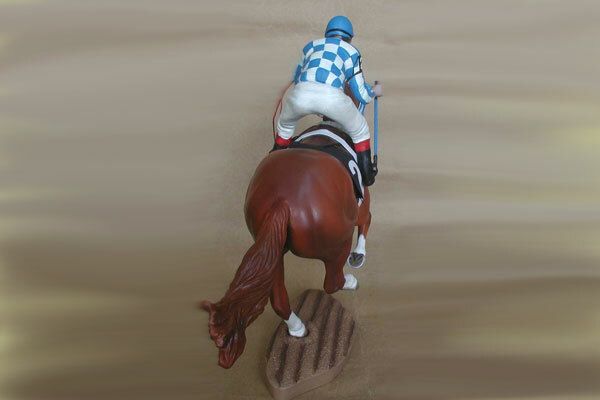 It is a standardized system used by virtually all race tracks. 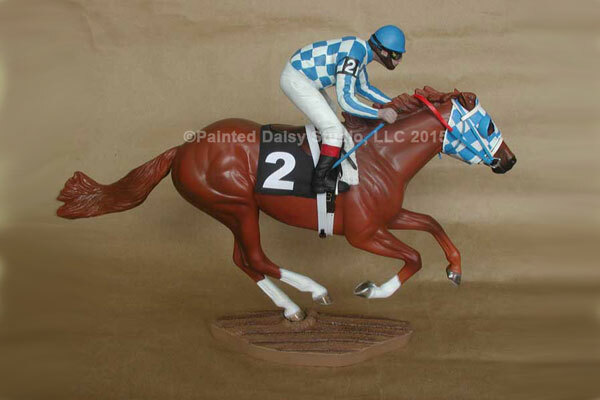 Click the link above to see what colors go with what numbers (post positions).